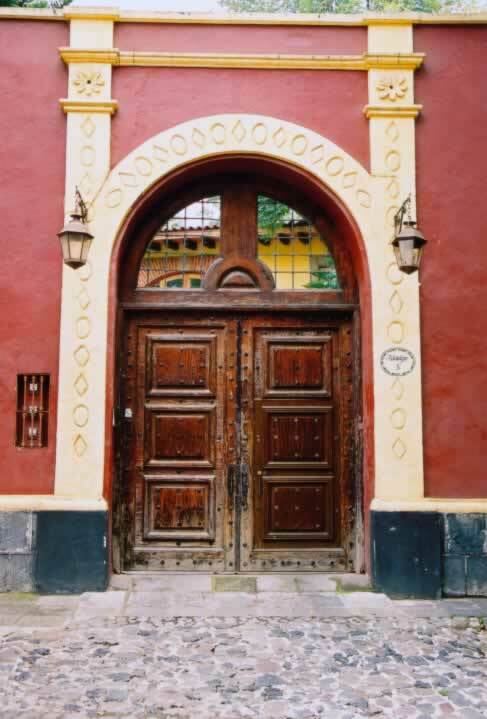 Together with the bow window above them, these over sized double exterior doors form a true arch. This arch is placed within an off-white carved archway with columns. Each door is framed with three equally-sized, raised panels. The panels are equal distance apart within the frame and have molded trim. On each of the panels, nine small bronze rosettes are placed in three equally spaced rows of three, forming a square. The same rosettes appear on the stiles around the perimeter of the door, on the rails--the horizontal part of the door's frame between the panels--as well as in the recesses of the panels. Though these rosettes form a pattern, several of them are missing. These wooden doors have not been maintained or protected and the wear and weatherization can be seen all over the doors, but particularly on the lower half of both doors, suggesting an environment that sees heavy rains or much moisture.